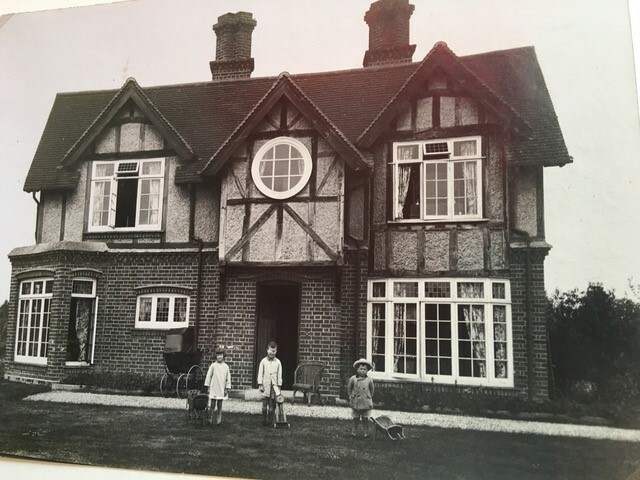 Eileen Gershon, Harold’s granddaughter said ‘My mother’s paternal grandparents (Henry and Florence Hart) lived at a house called ‘The Moorlands’, Meldreth…they had 8 children (and I believe some of the descendants still live in the village). My mother’s father Harold Baxter Hart was the second child. The 1911 census shows Harold lived with parents and his siblings in Meldreth Rd, Shepreth. His father was Henry Preston Hart (B: 1865 Barrington – started as clerk at brick works in 1881, manager of cement lime works, Barrington in 1891 & 1901), mother Florence Baxter from Bradford/Leeds, Yorkshire (M:1886). Harold was born in Barrington (J-S 1887) as was sister Grace & Oswald but rest of siblings were born in Shepreth. By 1911 mother had had 9 children with 8 surviving still living at home – others were Winifred, Harry Rosslyn, Lilian, Valentine Vernon & Elsie. Henry’s sister Kate lived with them also with her private means. Harold was a clerk for Cambs County Council age 23 in 1911. 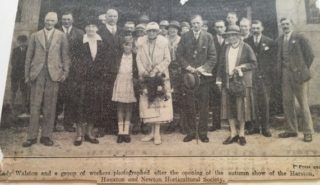 Harold married Olive Elizabeth Abbott in 1914 (Eileen has a drinks tray that was presented to him on this occasion by ‘the servants of Newton Hall’, but was unsure what the connection was). Douglas Winter, who worked for Walston farms, said Harold managed Lady Walston’s Thriplow farm estate (dairy) including Newton & Thriplow in 1920s &30s so that explains the drinks tray. Douglas also said that Harold married (J-S 1914 Royston) Olive Abbott from Royston whose family had a department store that sold furniture, prams, etc as Douglas bought their pram from there later on. Harold and Olive married in a non-conformist church. 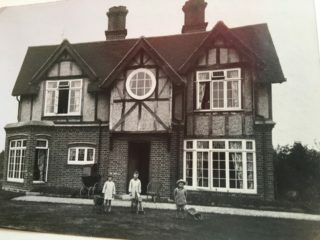 They had four children; Gordon (known as Billy) who was blind, Margery, Bernard and in 1923 Sheila (Eileen’s mother) who would have been in the pram in the photo, which therefore probably dates from 1923/4. 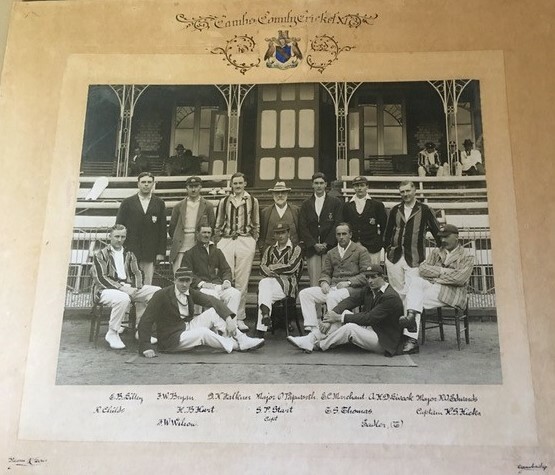 Harold was Captain of Cambridge Cricket Club and can be seen in the photo, centre row, second from left. 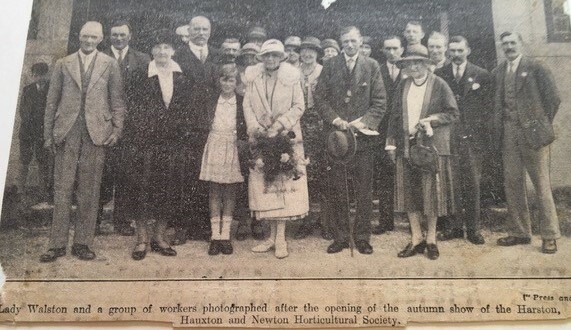 The newspaper clipping of Harston, Hauxton and Newton Horticultural show, from around 1930, shows Harold to right of lady Walston in centre (he worked for Walston farms then), and his daughter Sheila as a young girl, in the front row…. she presented the bouquet. Until Sheila was nine she had a governess in the mornings during ‘term-time’. She was not allowed to play with the village children, nor to join the Brownies inspite of a direct appeal to her mother from their leader. She loved the tennis court and grew up with a racquet in her hand! Her father Harold led the British Legion parade to a service in church one year and chapel the next! Sheila wrote: “In about 1933 we moved to Manor Farm, Hauxton…house almost opposite the church. Harold Died 29 Dec 1941 at his Manor Farm Hauxton, age 54, occupation Private Secretary, and was buried 31 Dec 1941 in Button End Cemetery, Harston.